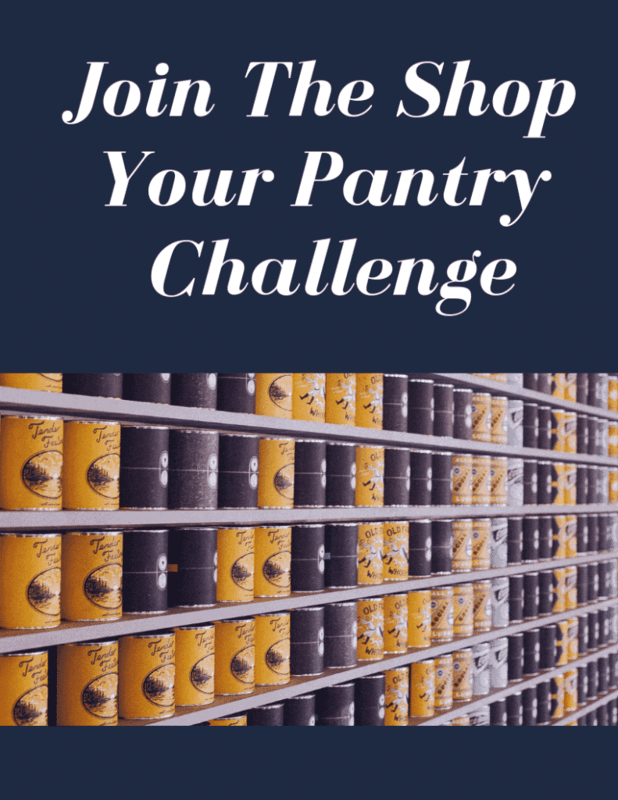 Have you heard of The Shop Your Pantry Challenge? It’s something that I recently started and I would love for you to consider it as well. I feel like we – as a society – live on autopilot. We buy things without thinking. We spend money without thinking. We truly eat without thinking. I am so guilty of this as well. I whine to my family that we never have anything to make for dinner, yet my pantry is lined with canned goods and boxes of options that I simply ignore. Well, I want to change that. I want to get through everything I have in my house and actually USE all the things I have in my kitchen before I head to the store to buy more of anything. And I would love for you to join me. The Shop Your Pantry Challenge is actually easier than you think. It’s more of a mind shift than anything else. So, how would this work? I’ve seen it done a few different ways. But this is how I want to incorporate it into my life. Once a month, for one week out of that month, I am going to initiate a money spending freeze. I challenge you to do the same. This means that everything that you USE must come from the inside of your house. Let’s clearly outline what that means – everything you eat, wear, drink, or watch as entertainment must come from inside the home. The hardest thing for me to do is to avoid getting a daily Starbucks for a week. I know I can just use K-Cups or whatever. But it’s more about the habit. It truly fills me with joy and I am going to be legit sad to omit that from my life. I think everything else is manageable. Truth be told, I probably will also be frustrated about making dinner on the weekends because mama goes on strike during days that start with an S. Even I need a break from time to time. But, like I say in the video, we are trying to save more as a family. So, I am willing to do whatever it takes. If you plan to Shop Your Pantry, your meals might start to look a little funny. It’s all about using what you have. So, if you end up with a can of black beans, spaghetti, and tuna… you’re going to have to make that work. It’s all about having an imagination, having fun, and keeping an open mind. If your family understands that it’s really only ONCE A MONTH, then hopefully they will jump in and enjoy the ride. What Are The Carve Outs? I think your Shop Your Pantry challenge can have some carve-outs if you want. For example, I always want my children to drink milk. I think that has to happen no matter what. So, if I happen to run out of milk, then I will absolutely go out and buy more. I’m not above that. Their health will always come first. It’s more about the main meals and snacks for me. I don’t want to make my children suffer and I know they need their calcium. Fresh food is important. So, I also will make sure that I am serving them enough vegetables. If I actually RUN out of vegetables, I will also be totally fine with running out to get more. But I don’t think that is going to be an issue for me? We have too much. I shop like the apocalypse is coming… and it’s not. Will You Join In On The Shop Your Pantry Challenge? I do the same as you…I buy the same 30 things in rotation at the store and make the same 20 or so recipes over and over. I think in addition to shopping my pantry I may also try to buy one new item every few weeks and make a new recipe with it. I’m in such a recipe rut. oh what a wonderful idea — I am going to try my hand at shepherds pie now.